Although Thucydides and Aristotle, as well as Homer, inform us, that kingdoms were hereditary, and of limited authority, yet the limitations appear to be very confused; they were the limitations of nobles rather than of people; and the first struggles for power were between kings and archons. The kings had no standing armies; and all the forces under their authority, even when they took the field, could be commanded only by the nobles, who had their peculiar districts of land and people to govern: these were illustrious and independent citizens; like the barons who demanded the great charter, communicated to each other their grievances, and took measures to remove them: but, being generally as averse to popular as to regal power, their constant aim was an aristocracy; they accordingly extinguished monarchy, but did not secure the rights of the people. The immediate effect of this revolution only multiplied evils. Oppressed by kings, Greece was much more oppressed by archons; and, anciently too much divided, was still more subdivided under the new forms of government. Many inferior cities disdained the jurisdiction, and even the superior influence, of their respective capitals; affected independent sovereignty; and each town maintained war with its neighbours. Each independent state had a right to send two members to the Amphictyonic council. The abolition of royalty rendering the independent states more numerous, increased the number of Amphictyons to one hundred members, and more; and an oath was required, that the member should never subvert any Amphictyonic city: yet every excess of animosity prevailed among the Grecian republics, notwithstanding the interposition of the Amphictyons. Argos was founded by Danaus, the Egyptian, about the time that Athens was settled by Cecrops. At the Trojan war it was the first of the states, and ever continued the rival of Sparta. Though the royal dignity seemed more firmly settled under Agamemnon than under any other chief, yet Argos was one of the first of the states upon the continent to abolish monarchy, and that as early as on the death of Celsus, son of Temenus, the descendant of Hercules. No account of its new constitution is preserved: but, from analogy, we may be convinced, that a restless body of nobles overturned the monarchy; and, as it was subject to frequent and violent disorders, that the archons could not agree upon the form of their oligarchy; and let up for independency in their different districts, states, or cities, a little sooner than in other republics. The higher and lower ranks were continually at variance; the democratical faction was commonly superior; sometimes tyrants were set up over all; and once, according to Herodotus, the slaves got possession of the city, took upon them the administration of affairs, and exercised the magistracies. The government must have been ill constituted, as no Rhadamanthus or Minos, no Lycurgus or Solon, no Zaleucus or Charondas, nor any other legislator of superior wisdom and probity, ever acquired the power; and no fortunate coincidence of circumstances ever occurred, to unite liberty and administration, law and government, upon a stable basis. One famous tyrant, Pheidon, lineal successor of Hercules, a prince of great abilities but no moderation, raised himself, rather than his country, to a superiority which ceased with him. For want of distinct orders, and steady balances, by which the wills and the forces of the people might have been subjected to the laws, Argos lost that pre-eminence among the Grecian states, which it had obtained under a monarchy. Every little town in Argolis was seized with the caprice of independence, and opposed the general government, at the same time that the metropolis betrayed an ambition to domineer over the inferior towns. Civil wars ensued: Mycenæ, Troezene, Epidaurus, and other villages of less consequence, were often conquered and garrisoned, but never subdued. Necessity taught them to unite. They reproached Argos with tyranny, and Argos the others with rebellion. Union enabled them to set at defiance their capital, by means of intrigues and alliances with Lacedæmon, the neverfailing resource of one party or the other in every democratical state. The pretence was, the Persian war, which Argos declined. This was called a base dereliction, and excited, by the help of Spartan emissaries, hatred and contempt in Sicyon, Naupila, Heliæa, and other towns, besides those mentioned before. Argos alone, of all the cities in the Peloponnesus, openly espoused the cause of Athens. This circumstance alone, if it was not accidental, is enough to show, that this city had more sense and profound wisdom than all the rest; for Sparta was certainly then leading all Greece to destruction. In other respects the Argives discovered the same temper, and the same understanding, with all the others; for they led their whole forces against Mycenæ, took it by storm, decimated the inhabitants, and demolished the town. Is it not sublime wisdom, to rush headlong into all the distractions and divisions, all the assassinations and massacres, all the seditions, rebellions, and eternal revolutions, which are the certain consequence of the want of orders and balances, merely for the sake of the popular caprice of having every fifty families governed by all authority in one centre? Even this would not satisfy; the fifty families would soon dissolve their union, and nothing would ever content them short of the complete individual independence of the Mohawks; for it may be depended on, that individual independence is what every unthinking human heart aims at nearly or remotely. Edited by Steve Farrell: In Letter 46, spelling has been modernized and paragraphs broken up for easier reading. 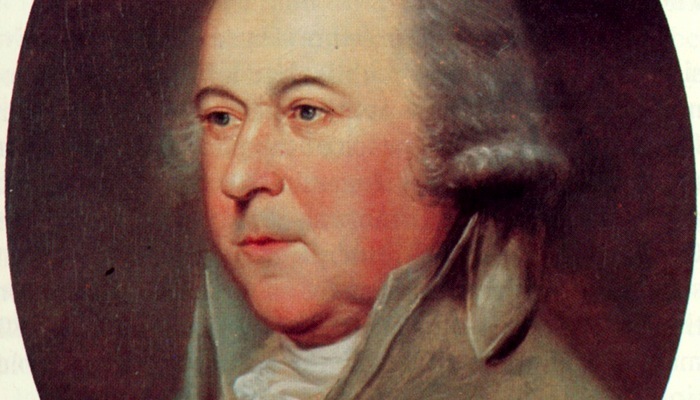 The original copyright of John Adams’ “A Defense of the Constitutions of the United States,” is in the Public Domain. As edited in this version: Copyright © 2011 Steve Farrell and The Moral Liberal.